Less than a week to go until Opening Day! For the red-hot Padres, it can’t get here fast enough. At 18-12, the Friars have the best record among NL West teams, rank third in the Cactus League and second among all National League clubs. The Padres have won 15 of their last 20 after a slow start, hitting .307 over that stretch. On the Spring, San Diego is averaging 5.8 runs and 10.3 hits per game. With the regular season quickly approaching, the first issue of this year’s Blueprint has been sent off to the printer. 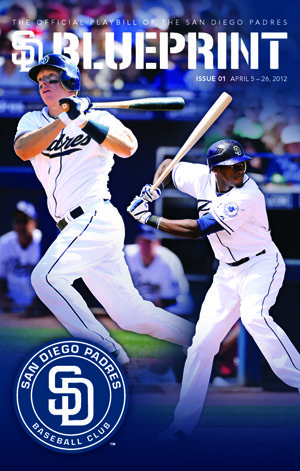 Here is a sneak peak at the first cover, featuring both Nick Hundley and Cameron Maybin. Both players recently signed contract extensions, ensuring the Padres future down the middle of the diamond. The Padres have split-squad games today, with most Big Leaguers staying in Peoria to take on the Indians and Bud Black leading a squad down to Tucson to take on the Rockies. 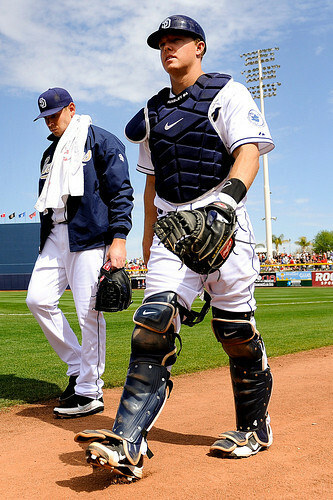 The San Diego Padres today announced that they have agreed to terms with catcher Nick Hundley on a contract through the 2014 season with a club option for 2015. Hundley, 28, set career highs in nearly every offensive category in 2011, including runs, hits, triples, home runs, batting average, on-base percentage and slugging percentage. He hit .288 (81-for-281) with 16 doubles, five triples, nine home runs, 29 RBI and 34 runs scored in 82 games, including 73 starts behind the plate. As catcher, he threw out a career-high 24 would-be base stealers last season, besting his previous total of 13 from 2008. Since making his Big League debut in 2008, Hundley has posted a 3.94 ERA that ranks seventh among National League catchers over that four-year stretch.